Rochelle Owens has made a name for herself for her avant-garde plays and her poetry which take the reader into uncomfortable territory of taboo, flesh, violation, body fluids, and life. The graphic nature of her imagery has been the “shiny object” that generally captures the critic’s attention, and unfortunately the sometimes shocking nature sometimes blinds them to the work’s philosophical complexity and her subtle commentary on how we see reality, beingness, and becoming in a world that contains intersections of imaging technology and the body / person herself. Hermaphropoetics: Drifting Geometries is a collection of poems describing a series of stills in videos depicting the same object (a person). 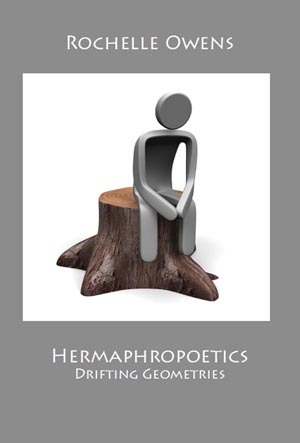 To summarize, Hermaphropoetics is about the fragmentation of unity and/or the deconstruction or deliberate disassembling of unity. The various poems illustrate how there are many ways to see the same thing. Owens takes a series of still photos that comprise a video and describes them individually. However she does not say where exactly they fit within that series of images. Observing one still after the other creates a historical continuum from the first videographers, the Lumiere Brothers, to today’s high-tech videographers. Rochelle’s emphasis on the fragmentation of video and the dissolution of a recorded event also brings to mind today’s more or less omnipresence video making abilities in the form of smart phones. We are reminded that the technology has made us tend to forget that video still is a series of single frame images. The parallel with language is clear. Language creates a reality and the words (parole) are the individual stills. Take them out of sequence and the reality they create is mediated – always – by the reader / audience. On a cellular level we like to think that the raw images create reality. Rochelle Owens shows us that once you stop the flow - image after image after image, you suddenly find yourself unable to actually connect with the reality until you place it within a narrative which by definition includes language. That language does not necessarily have to be verbal but there is a language nonetheless. So Owens considers video stills. We can say that they must exist in a certain order to gel into meaning(s). The stills constitute the words and the parole of the grammar of visual discourse. The sequence of video stills demonstrates that all meaning is in essence a construct that is constantly being deconstructed and reconstructed. The repetitions of images are like incantations. They rip open and expose the heart and a sense of life. When Rochelle discusses exposed flesh she’s also talking about the private laid bare in the raw, painful moments where one is subjected to the indignity of the gaze. The camera is invasive. It creates in the subject a profound level of humiliation that has to do with one’s autonomy. The individual in fact is a being, and that beingness is suddenly stripped away and placed in the hands of the individual who has the capability of ordering the series for sequences of images and also to create a narrative that describes what is happening. In addition to creating sequences, Rochelle Owens creates fragments and in doing so reveals how it is possible to cast the meaning-making process into indeterminacy. In doing so, she seizes upon the nature of what it is to create art. There is the artifice of becoming and the frames seem to be becoming something, but the frames can never become anything without the reader’s externally imposed narrative. We crave explanations and we want a sense of the whole but the parts do not and cannot add up because the video stills that come together to make a narrative are inadequate to keep the mind of the post-postmodern reader in a single track. The objectification of that frozen moment of death, nakedness, vulnerability and exposure is what Rochelle Owens has created. Owens's avant-garde plays and poetry have always had a way of making reader feel vulnerable and awkward. On one level, that emotional response is in part about the process of coming to grips with indeterminacy. The camera is in essence the technology of object-making. The accompanying consumption occurs by creating the tools by which the reader enters and then slowly moves into a state of self-fragmentation. Self-fragmentation is painful at first, but after 10, 20, 30, 40, and 50 repetitions profound desensitization occurs and one enters into almost an almost trance-like state. Each camera technique offers its own slow trajectory. Life’s puzzle pieces are meaningless when scattered out of order. Repetition, despite J Hillis Miller and his notion that there is no meaning without repetition, does not necessarily hold water. Simple repetition does not make meaning. Patterns are patterns. The assignation of value that is to assign value to the pattern - whether denotative or aesthetic - is arbitrary. Nevertheless, there can be a sense of urgency if the pattern has some kind of consequence in the phenomenal world, such as being run over by a car or the likelihood of certain aggressive behaviors of dangerous people. Rochelle Owens shows the absolute arbitrariness of life force elements that we generally consigned to the sacred.